Getting WET and Saving Lives. Read about how Executive Director, Ben Rayner, began his career in water safety and how it inspired him to create WET, Inc. This article was printed in Smithsonian Air & Space Magazine in Dec. 2014. WET Exec. Dir. Ben Rayner, training fourth graders from Guilford Troop 475 at the Westbrook, CT YMCA. Your donations allow us to provide the education and training that will help save the life. Thank You! When Should You Swim For It? Should I Swim For It? So you find yourself alone in the water far from safety, when do you swim for it? The decision can be a matter of life or death in an emergency. There are a number of variables; are you injured? when did you last eat? (You’ll need those calories), how cold is the water? Your movements may be of benefit, but it will cost you energy, energy that you need to survive. Today’s thinking is to swim only short distances for very specific reasons; to get to something good (Safety) or to get away from something bad (Fire/fuel, debris). Don’t swim for swimming sake. If possible, adopt the HELP position or Carpet Formation, or simply float on your back. (See RISAA Nov. 2017, issue 227) Your survival instinct may be telling you to do something, but in many cases staying put is the best alternative. Also, rescuers will be looking for you close to the sinking or overboard location. The farther you swim from that locale, the harder it will be for rescuers to find you. If you are with other survivors, always swim as a group toward the target. In case histories where one individual was tasked with trying to swim for help or a life raft, they either perish or are the only survivor. The best technique is the “Chain Formation”. With all survivors facing the same direction hook your legs around the person in front of you, and your feet should go underneath the person who is two in front of you. The person at the head of the chain is the captain and should shout out a cadence with as few syllables as possible, such as, “arms up-stroke” or simply “arms-stroke”. This formation works most effectively when it is done in unison. The person at the end of the chain should not stroke, but keep the chain together and lightly flutter kick so as to lessen the drag. The benefits; all survivors are together, and the sharing of body heat. Like any movement, however, this formation will still be an energy drain. I instruct all my students to go with the flow. Humans are not efficient in the water, even a strong swimmer can only mange one mile per hour or so. Just a half-knot current, will rapidly exhaust you. If forces are pushing you, even if it is away from land or safety, go along for the ride. Case histories can be found of people making epic swims, but they are truly the exception rather than the rule. For every case of a victim attempting and making a long swim, there are dozens, in which people have perished when attempting to “make it” by swimming. Also, swim on your back if you have a flotation device. Natural swimming styles with a donned vest will be very difficult to manage and burn far more energy. Simply lay on your back, utilize slow lazy back strokes, and conserve those calories. The Chain Formation is the most efficient method to move as a group. Remember: Swim short distances, to get to good, or away from bad. 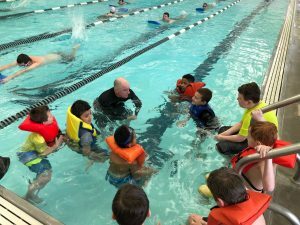 WET had an awesome training session with Cub Scout Troop 475 of Guilford this past weekend at the Valley Shore YMCA in Westbrook, CT. 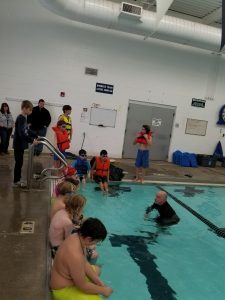 The scouts were able to learn several hands-on techniques to stay safe in the water, including the HELP position and the Carpet Formation. They were also able to achieve their water safety pins. Thanks to Linda Van Steenbergen and all the parents of Troop 475 for their help and interest. Above: Scouts learning the multi-survivor hypothermia mitigation technique called the Carpet Formation. This skill floats survivors in the warmest part of the water column, survivors share body heat, and it makes you a bigger target for rescuers. Above: Scouts performing the Heat Escape Lessening Posture (HELP) position. This technique is used for a sole survivor. It minimizes movement and saves energy. Enhanced with a contractors grade 3 mil trash bag, it is even more effective. Called the “poor man’s wetsuit”, the bags work in a similar fashion and can maintain core temps far longer than without it. Above: Executive Director, Ben Rayner, giving the Scouts sound advice on staying away from any moving water, river, currents, and rips. And to stay away from cool and cold water. More people die every year in America from drowning than they do from distracted driving, and often it is due to low water temps. Let’s get the word out and lower all those numbers! 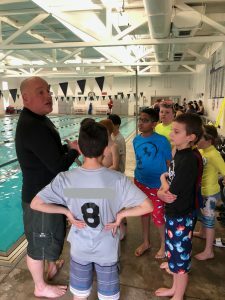 WET also wants to thank Chris and Pat at the Valley Shore YMCA for allowing us use of their incredible facilities, and for giving us the opportunity to spread the word about water safety! 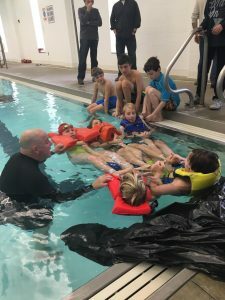 Since February 2017, eastern Connecticut has witnessed at least five tragic drownings that all could have been prevented. The victims ranged in age from 10 to 63 years old. These incidents occurred in ponds, rivers, estuaries, the sound and the open ocean. Unfortunately, the common denominator was lack of knowledge about the hazards of the water. According to the CDC, drowning is among the leading causes of accidental death for children 14 and under. The main cause of this is supervisory inattention. Drowning is also a leading cause of death for males 18 to 30 years of age. 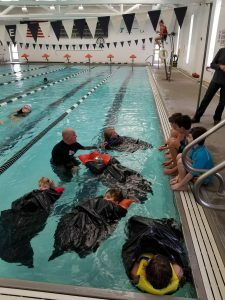 Water Emergency Training is a non-profit dedicated to drastically reducing the number of these drownings through education and training. Just a few moments of inattention is all it takes for a tragedy to occur. In the time intakes to go inside and use the bathroom or to fix a cocktail a child can be unconscious and drowning. This very tragedy happens every day in America. Recently I was fishing at Esker Point in Groton. While I fished I observed two women lying on their towels one of whom was asleep and the other reading a book, both with their backs to the water. But there was a small toddler, maybe 2 years old, who was joyfully playing in knee deep water. This is just how a tragic drowning occurs. Swimming lessons are an essential first step, but they not enough on their own. It is not possible to “drown-proof” a child or anyone else. Every day in this country someone who was considered a “strong swimmer” drowns. Pay attention and know what to do if an emergency arises. Another misconception is how long it takes to drown. If you go into 60 degree water or less, your survival time isn’t measured in hours or even minutes, it’s often measured in seconds. Boating deaths also make up a large percentage of drownings. Whether kayaking, power boating or sailing, anyone on a vessel needs to understand the basics of water safety. 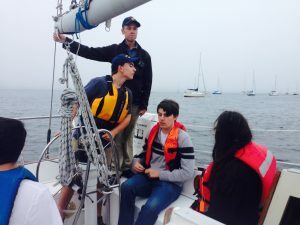 It is essential that you not only get certified in basic boating skills, but also in general water safety, including local waterway knowledge. Always wear a life vest, especially if you are in a kayak or canoe. Two years ago I witnessed a woman in her 60s or 70s paddling a kayak 300 yards off of Groton Long Point with no vest, in October. At WET, Inc. we can help you and your family stay safe by giving you the knowledge and training needed to prevent a water emergency and to help you survive if one is unavoidable. Ben Rayner is a former survival instructor. He is executive director of Water Emergency Training Inc., a nonprofit dedicated to preventing drownings. 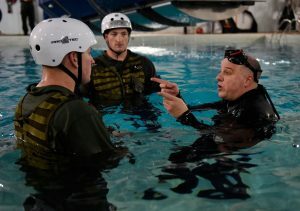 For more information visit www.wateremergencytraining.org. Kindness in Real Life is a regular feature in which we encourage writers to tell about kind acts being done in the community. To submit your own story and photos, email Lee Howard at l.howard@theday.com. 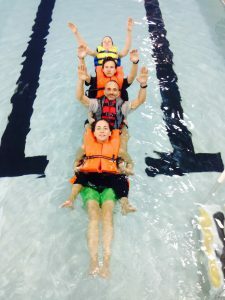 In keeping with our mission, Water Emergency Training presents survivor stories and the lessons learned to be a strong voice for how to stay safe in the water. Please contact us at info@wateremeregncytraining.org/ if you would like to share your story of survival, water emergency experience, or knowledge. A honeymoon in Hawaii; golden sunsets, beautiful blue waters, scented breezes, what could possibly be hazardous in such an inviting paradise? Unfortunately, the Hawaiian Islands despite their enticing beauty can be deadly for locals and tourists alike. 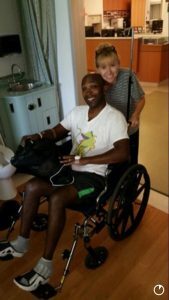 In 2014, my old friend JT Moye and his wife Debbie were faced with a dire water emergency while on their honeymoon on the island of Maui that almost cost JT his life. JT is someone who is in excellent physical shape, both he and his wife, Debbie, know how to swim, and they were not engaging in activity that appeared to be dangerous or foolhardy. “We were snorkeling in the bay, on our own, not with a group. So it was just the two of us, but there were people around so we felt safe,” JT recalls. In JT’s case, pure exhaustion was the main culprit in his drowning. “We had been in the water about 45 minutes, I was starting to get tired, but not overly so. We were getting ready to go in. Debbie was ahead of me. Then my snorkel got filled with water and I just couldn’t clear it,” JT says. In an attempt to clear the device JT had to tread water and soon was exhausted from the effort of staying afloat and trying to breathe. “I knew I couldn’t panic, so I tried to just lay on my back and calm myself, but the waves washed over me into my nose and mouth and after that I went under and blacked out,” says JT. JT remained unconscious for most of the ordeal and only realized what had happened when he regained consciousness the next day. Like many drownings, JT was hospitalized for several days, he was released, but had to be readmitted for another three days after developing pneumonia. Though not the usual outcome after a water emergency, problems such as pneumonia can develop after a drowning incident. Anyone with unusual symptoms after a drowning incident, such as mental confusion, frothing around the mouth or nose, or coughing should seek medical attention immediately. JT’s incident highlights the importance of not only knowing the waters in which you recreate but making sure you have the energy and stamina not just to get to a spot in the water but to get back. It only takes seconds for a water emergency to arise and JT’s experience highlights this. A beautiful day can turn tragic in a matter of seconds and a little forethought about conditions, currents, and local knowledge can be a life saver. JT says that the main lesson learned is to take a course or to go with a group or someone with local experience when entering the water. Whether snorkeling, kayaking, SUP-ing, surfing, or any water activity, if you are unfamiliar with the area make sure you know before you go. A small bit of knowledge can go a very long way to helping keep you safe whether on the water or an outdoor activity. JT and Debbie are all smiles after their harrowing ordeal on a quiet Hawaiian beach. Their experience could have been a tragic one and is a great lesson for anyone swimming or involved in water activities at an unfamiliar spot. 9/25/17-An honor to train Sea Scout ship # 584. What a great group of folks, some mariners in the making! Special thanks to Marshall Parsons and Jim McCabe from Sea Scouts for the opportunity to be a part of their training. Off New London in the Thames, beautiful sunset on one side and sea fog closing in on the other. It may seem like a question that has an obvious solution, but what is drowning? The answer is not as easy as you might believe. In fact, as a writer and researcher, I am learning new information about water safety all the time and WET wants to share these valuable insights. Drowning, like cardiac arrest, or a car accident does not imply death. Just as you can suffer cardiac arrest or be in a car accident and still survive, drowning is defined the same way. In medical speak there is no such thing as a near-drowning, all drowning incidents, whether fatal or not, are defined as drownings. Also, terms such as dry drowning and secondary drowning are not considered proper definitions and are not used by medical professionals such as the World Health Org., the Red Cross, and the CDC, despite their common usage in the media. 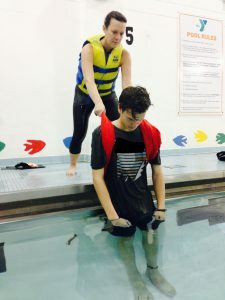 Dry drowning is a term that was coined due to the fact that somewhere between 10-20 percent of drownings victims, when autopsied, show no evidence of water in the lungs. One theory is that some form of laryngeal spasm occurs that closes down a person’s airway causing them to suffocate rather than drown. However, most medical professionals seem to disagree with this theory. More than likely this is just a simply matter of misdiagnosis. Very often little water enters the lungs in a drowning and this might be overlooked in an autopsy, seeming to indicate a lack of water in the lungs when there actually is a small amount present. Secondary drowning, a term which I have used myself for years, also is not medically correct and should not be used to describe drownings. Secondary drowning describes the events that can occur shortly after victims are rescued from a water emergency. Though not the usual outcome, some survivors of a drowning can have symptoms worsen shortly after rescue. Despite the fact that there is no recorded instance of a person dying days or weeks later after a drowning incident, when displaying no adverse symptoms at the onset, victims can worsen and even perish after rescue due to the aspiration of water and the complications that arise from it. However, this normally happens minutes to hours after removal from the water. Claims of fatal outcomes days or weeks later have been shown to be misidentifications of other medical issues. The reason for this post-rescue complication is that when water enters the lungs it interferes with a surfactant that coats these organs. This leads to interference with oxygen exchange, which can then lead to the development of pneumonia and other medical complications that can be fatal. This is compounded in salt water, which irritates the lungs more strongly than fresh water causing people to perish from drowning even after rescue. To review, there is no medical definition for dry drowning, secondary drowning, or near drowning. All drownings are just that, drownings. They have three outcomes, a fatality, drowning with illness or injuries, drowning without illness or injuries. Information from The International Life Saving Association was cited for some sections of this article. For more info please visit their site, www.ilsasurf.org or read their very informative white paper, Drowning in a Sea of Misinformation: Dry Drowning and Secondary Drowning. It is available on their website. It is important that if you or a loved experiences a water emergency or a drowning incident, especially if no emergency responders have seen and or treated the victim(s), to make sure that the person is seen by a medical professional. Symptoms of a submersion or immersion quite frequently include, coughing, foam or froth in the nose or mouth, and unusual mental incoherence. However, if these symptoms worsen you should seek medical attention immediately. Also, any child that is involved in a drowning incident should be seen by a medical professional immediately, regardless of the level of symptoms. The above photo demonstrates the towel extraction technique. This is a very useful skill when trying to extract heavy victims from the water or when attempting to pull an unconscious victim out of the water and over an edge like the pool in the photo. The design of above ground pools make it extremely difficult to get an unresponsive person out of the water and to safety. The towel extraction is an excellent method for these scenarios. For more on this and other safety techniques browse our site or buy the new book, Water Safety by Ben Rayner.